What are the Best Tips for Capital Acquisition? 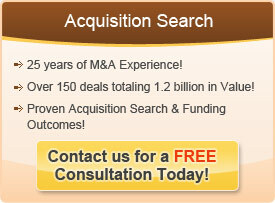 To successfully acquire acquisition capital, companies should be well-planned and strategic in approach. The best tips for capital acquisition follow a logical project sequence. Firstly, companies need to do their homework and decide what type of capital suits them best. There are many different types of loans and different types of acquisition capital available in the market. Secondly, companies need to assess whether they have the people internally to manage this project. Often, growing companies do not have expert financial people on hand to lead the project. Thirdly, companies have to make sure they have financial statements and a business plan ready to show potential capital providers. This information should be in a highly professional format, displaying the historical profitability of the corporation. The business plan should highlight the strengths of the corporation. Potential capital providers will evaluate the company on how professional this information is so it pays to spend time to work with a financial consultant to make sure your information is ready for distribution. Fourthly, contact with the financing providers should be initiated. The company needs to contact several dozen potential financing providers, to ensure they can close with at least one firm. Often companies do not have a large enough list of prospective financing firms to contact. Gone are the days when the local bank can be relied on to provide a loan. It pays to work with a financial consultant who can help you target the right types of financing firms for your specific capital need.